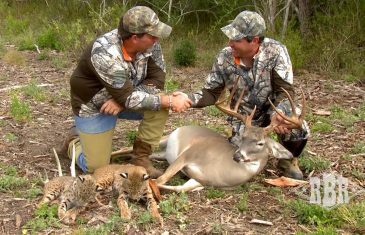 The RBR Ranch in South Texas, between San Antonio and Corpus Christi, features managed whitetails, turkeys, wild hog and more. A favorite hangout of The American Outdoorsman. John Tilsby is in Central Indiana and literally has to wait for these two bucks to finish fighting. Tilsby then makes it his mission to claim the winner, with his muzzleloader rifle. AOTV Host Jim Mueller heads to Colorado to find some of the biggest Elk he has ever seen. The exotic 777 Ranch holds many animals that can take your breath away, but today’s special guest Karen Lutto goes after the indigenous whitetail. Check out this southern Texas hunting ground as she looks to harvest her first whitetail.